During the initial homage to Wayne Rooney before England’s match against the United States, we saw Harry Kane in the picture. We explain why. 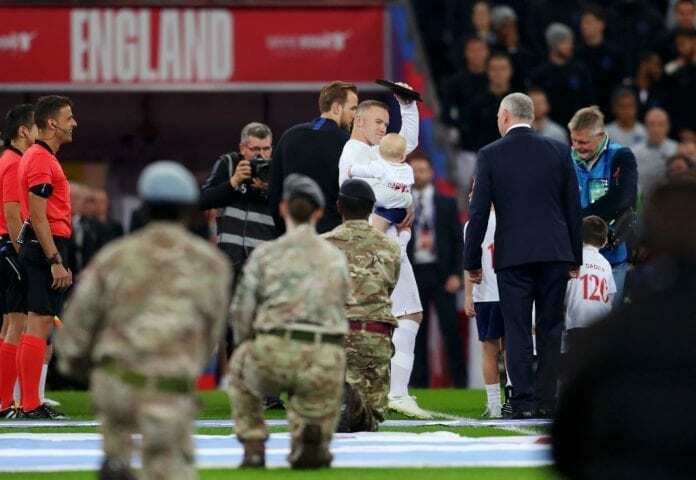 This Thursday’s England match against the United States was mostly about Wayne Rooney’s farewell, the legendary striker got the huge honor of one final match but we saw a confusing image of Harry Kane handing him the recognition before the match and even taking pictures. The reason for this has a very interesting explanation that describes Wayne Rooney’s modest personality quite perfectly, something that a normal man from the working class Liverpool family would do. The fact that a striker like Harry Kane was there to share this unique moment alongside Wayne, is because the DC United striker is convinced that the Tottenham forward will surpass his 53 all-time scoring record soon and he wanted to start feeling what it was like to share the stage with him. In a sense, the Manchester United legend was living a similar experience that Sir Bobby Charlton had to go through twice with Wayne in both England and Manchester United. We can’t forget that Rooney is not only the all-time English top scorer, but he is also the Red Devil with the highest goal-scoring honor and he beat Sir Bobby on that honor twice. Maybe due to his affinity as a Spur, Harry Kane will never know what it feels like to be the Manchester United all-time top scorer but England is a very different deal. Because at only 25 years old, Harry Kane has already scored 19 goals in 34 matches with the Three Lions and he still has a very prolific career ahead of him. Wayne Rooney could obviously smell this, which is why he decided to have the Spurs’ player accompany him alongside his four kids and his wife before this Thursday’s match. Harry Kane obviously accepted this honor with a smile on his face, because the England legend is one of his role models as he was growing up as a player in English football. The striker spoke to the BBC after the match and they asked him why Kane was alongside him during the ceremony, Rooney was honest in his response and revealed that he is already preparing to pass the baton for when the Spurs’ main man surpasses his record. After the initial protocol during the early minutes of the whole event, we already knew that Wayne Rooney wasn’t going to be able to start the game but he did come in during the second half. Wayne played a good half hour of the match and was able to share great moments with some of the very promising young talents in English football, he expressed how amazed he was at the bright future that most of these lads have ahead of them and also praised manager Gareth Southgate for his work with all of them. One of the most curious moments of this Wayne Rooney farewell, was when he and Jadon Sancho combined passes between the two and made everybody at Wembley have a great reaction as they were watching the generational shift right before their eyes. Kane may be the one who will surpass Wayne Rooney as the all-time goal scorer for England, but Sancho is the player who is looking as precocious as the legendary striker did when he was starting to build his incredible career. Kane is more of a late bloomer compared to other young stars that we saw last Thursday. What do you think about Wayne Rooney’s response about Harry Kane possible surpassing his record so soon? Please share your opinion in the comment section down below. Quiz: How deep is your knowledge about Dele Alli?